Ahead of the much anticipated sequel to writer/director Roland Emmerich's eponymous science-fiction movie released in 1996, this Summer's Independence Day: Resurgence is already shaping up to be the return to the action-adventure vehicle that made the franchise into the contemporary blockbuster classic that is today. Following the release of the latest theatrical trailer, fans of the original Independence Day (also released by 20th Century Fox) are no doubt in state of unbridled glee in regards to the return of the much beloved landmark of late 1990s cinema. Independence Day: Resurgence is set to star returning cast members Jeff Goldblum, Bill Pullman, Judd Hirsch, and Vivica A. Fox, alongside property newcomers Liam Hemsworth, Charlotte Gainsbourg, and Maika Monroe. But despite the presence of an enviable collection of fresh talent, the latest viral clip for the new movie paints quiet the historic picture of the reverence still held for the events of the now fabled War of 1996. In the footage featured above, fictional news network United World News presents a twentieth anniversary retrospective of the events formerly depicted in the original Independence Day film. The entire video runs in a manner and tone largely in keeping with the previously-released Resurgence viral clip detailing a world changed by the introduction of Alien technology, all of which may be seen in light of the immediate fallout and subsequent aftermath from the War of 1996. There's certainly plenty for die-hard fans to fawn over in this loving tribute to the fictional alien invasion of the classic Emmerich genre film of 1996, and might even win a whole new generation of fanatics to the property by the time of the theatrical release of Independence Day: Resurgence this June. It's easy to forget the tragedies inflicted upon the masses at your local multiplex over the years, but this bit of promotional advertising should serve as a reminder of why the War of 1996 is of such importance to remember and learn from heading into the subsequent extraterrestrial battle soon to come. 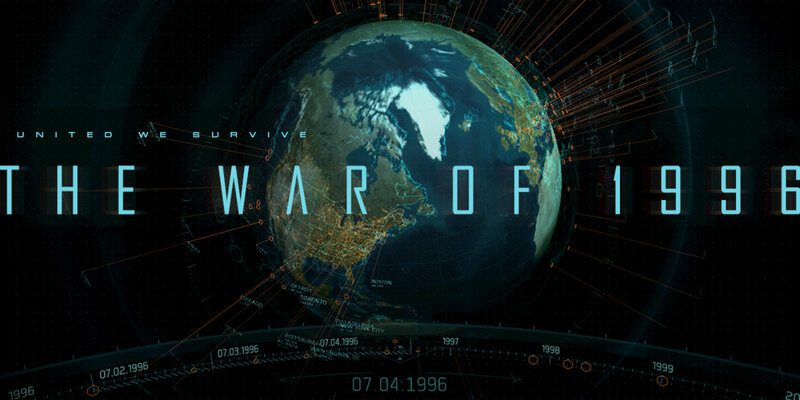 Even if an Independence Day sequel might strike the casual moviegoer as superfluous and silly on first glance, with any luck this War of 1996 viral clip will serve to imbue some levity into what is sure to be an action-packed thrill ride. In just under two months' time, viewers around the world can plan to see the return of Emmerich's modern franchise classic in Resurgence - and trust that Goldblum will light the way once more toward a final and climactic resolution to the impending War of 2016.